Potato salad is a perfect addition to any summer grill out, but having the same thing over and over can get kind of boring; in my opinion at least. To mix things up a bit, I decided to do a twist on one of my favorite sides, a loaded baked potato, but turn it into a chilled salad for the warmer summer months. 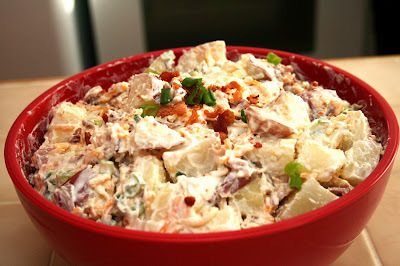 I have made this twice now for gatherings, and it has been a huge hit each time! It's super easy to put together, and pairs nicely with pretty much any main dish you want. 1) Dice potatoes into small to medium sized chunks and place into a large pot. Fill with water, until potatoes are just covered. Boil over medium-high heat until soft (do not over cook), about 10-15 minutes. 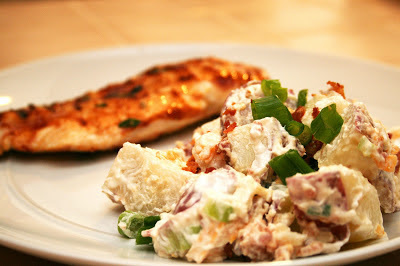 2) Mix potatoes with butter; add sour cream and mix until well-coated. Add bacon, green onions, and cheese. Stir until combined. Refrigerate until ready to serve.